Kate Henderson, the Chief Executive of the National Housing Federation, has applauded the innovative partnerships amongst housing providers in Greater Manchester, after being invited to speak with a consortium, made up of 26 housing organisations. Kate met representatives from Greater Manchester Housing Providers (GMHP), which was formed in 2012 and collectively play a major role in meeting the city region’s need of 227,000 more homes over the next 20 years. 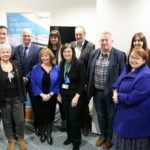 The event was hosted by housing provider One Manchester, a partner in the group, which owns and manages more than 12,000 homes in central and east Manchester. At the event, Kate was keen to find out more about the GMHP’s relationship with the Greater Manchester Combined Authority (GMCA), how the partnership anticipates the affect Brexit may have on housing in Greater Manchester and Kate gave updates on her priorities for the National Housing Federation. When speaking about the success of the consortium, Kate said: “The strategic approach that GMHP has to solving issues in Greater Manchester, not just in the housing sector but across issues such as homelessness, skills and employment, and health, is innovative and refreshing. There is great work going on amongst housing providers and their partners, and much for other areas of the country to learn from. Following the event Kate was then invited to tour One Manchester’s first eco modular construction scheme, Stoney Gate, in Openshaw. This rent to buy development will launch in April and is built to Passivhaus standards, a model of energy efficiency, which can provide residents with a considerable cost saving on energy bills. It consists of 21 three-bedroom houses and is situated on the site of a former Eastlands Homes older persons scheme.